A man dressed as Batman attempts to stop a robbery. Meanwhile, the real Batman is tracking down Tom Dalton, a former Olympic athlete who has dropped out of public view. The false Batman is shot, and returns to his apartment, collapsing in front of the real Batman. The imposter and the athlete are one and the same. 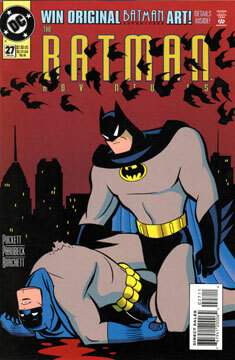 Batman takes Dalton back to the Batcave for medical attention from Alfred. Batman learns that Dalton’s wife was murdered when she was accidentally caught in the crossfire between to mobs. Since then, Dalton has had no purpose in life. Batman takes Dalton to a secluded forest, and promises Dalton that he will train and test Dalton for two weeks. If Dalton passes, he can continue fighting crime. Meanwhile, Pete Wilson, the mobster responsible for Dalton’s wife’s death, returns to Gotham at Rupert Thorne’s request. Two weeks later, Dalton returns to Gotham and sees Wilson. Dalton attacks, but ends up Wilson’s prisoner. Batman finds them, and a fight ensues. Dalton ends up dangling from a broken ledge, with Wilson hanging onto his legs. Dalton threatens to let go and end both their lives, but reaches for Batman’s hand at the last second. Finally, Dalton and Batman discuss how to control the anger and rage the drives a need for vengeance. Overall, not a bad plot. I tend to enjoy these occasional “slice of Gotham life” stories. And these tend to be better than the average kids fare, especially back in 1994. Parobeck does fine, as always. But like the last issue, there wasn’t much in the way of striking visuals for him to shine. It was fun seeing Batman in a day lit forest, though.